50 million Americans or 1 out 6 people are on a prescription psychotropic drug for depression, anxiety, sleep disorders, bipolar. The minds of modern humans are under assault due to poor nutrition, toxic burden, lack of sleep and undue stress. Depression, anxiety and poor concentration are real illnesses that can interfere with the quality of your life. And, as anybody suffering from any of these illnesses will tell you these conditions are more than just feeling low. The brain is the central organ that controls how the body works and how we think. Any sustained change in the brain chemistry can have tremendous effects on brain functions. The better known causes of these metal conditions include grief, stress, and changes in hormone levels. But besides these, nutrient deficiencies can cause depression, anxiety, or poor concentration. This means that while these conditions are assumed to have psychological causes, this is not always the case. And yet, doctors will normally prescribe anti-depressant medication without investigating all the possible causes. Deficiencies of omega 3 fats(such as fish oil) are a primary cause of depression and anxiety in developed countries. Lithium is a trace mineral that is not considered essential in human nutrition, but evidence shows that a lithium deficiency can lead to mental problems. Calcium has a huge impact on physical and mental health. Its deficiency can cause anxiety. Some nutrient deficiencies result from consuming junk and sugary foods like chips and soda. Junk food also leads to obesity in the long term which may also cause depression, anxiety, and poor concentration as a result of low self esteem. 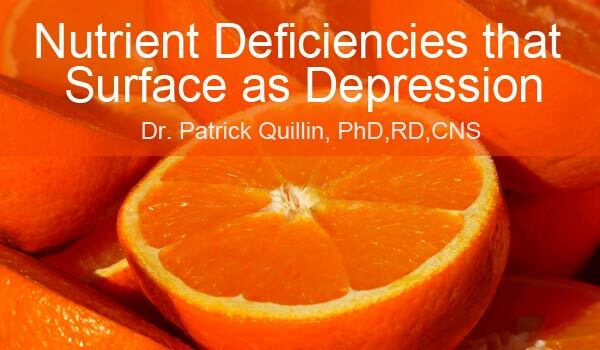 Why Do Nutrient Deficiencies Surface As Depression, Anxiety or Poor Concentration? Nutrients are vital for normal body and mental functions. The brain psychopathology and metabolism function well when there are adequate nutrients. However, even when people overfeed, they may be undernourished. This can lead to physical or mental issues. Because various minerals and vitamins are involved in brain functions, deficiencies can affect these functions negatively. And depending on the part of the brain affected by the deficiency; depression, anxiety or poor concentration may result. B vitamins are required for various functions including methylation cycle, DNA synthesis, monoamine production and also maintenance of phospholipids. The fat-soluble vitamins A, D, and E, on the other hand, help in antioxidant recycling, genetic transcription as well as inflammation regulation in the brain. It follows that deficiency of vitamins B-complex, A, D and E suppresses the above operations. For the brain to function properly, it needs adequate supply of eight amino acids. These are essential to life as well as the synthesis of neurotransmitters and precursors which carry out communication within the brain and the entire nervous system. Amino acids supply the body and the brain in particular, with chemicals that are required to generate pleasure, combat aging, alleviate pain and protect against radiation. Amino acids help a great deal in healing depression, poor concentration and anxiety. Deficiency may eventually cause mental issues. Zinc plays a vital role in synaptic and axonal transmission. Zinc is necessary for the metabolism of nucleic acid and brain growth. Lack of zinc can cause mental problems such as learning and behavioral disorder, as well as the inability to deal with stress. Expectant mothers with zinc deficiency in their last trimester have babies with smaller than normal brain, with less than half of the total number of such babies having learning ability. Magnesium is essential for pulmonary functions. Its deficiency leads to confusion, memory impairment, irritability, and learning disability. Does Addressing the Deficiencies Stop The Symptoms? Adequate nutrient intake is necessary for the proper functioning of the body and brain. You can achieve this by going for lab screening to check whether the symptoms you have revolve around specific biochemical imbalances. It is worth noting that addressing the deficiencies alone may not stop the symptoms due to other non-nutrient related factors. A blood test can be done if lab tests don’t seem to link the symptoms to biochemical toxicity or shortage. The blood test is known as functional intracellular analysis (FIA) or Comprehensive 3000. This test measures the many vital vitamins, amino acids and minerals that are available at the cell level. FIA gives a clear picture of nutrients that are present in blood. While you could be taking a well-balanced diet, on performing the FIA tests, the results may show very low levels of a nutrient or vitamin due to other factors such as emotional depletion, etc. In such a case you may need to supplement, sometimes in mega doses, until a level of sufficient need is reached. While depression, anxiety and poor concentration may be considered mental conditions, they can result from nutrient deficiencies. And although taking adequate nutrients can be challenging, it is critical for not only your physical wellbeing, but also your mental health. Ensure that you eat a well balanced diet consisting of a wide variety of ingredients rich in proteins, vitamins and minerals. However, because you might be eating healthy and still be nutrient deficient, you should go for regular lab tests. You can then supplement for any deficiencies so that you are healthy both physically and mentally.